The challenge of measuring time reaches back to the origins of human consciousness. From a 28-day periodicity of the moon (and human female menstruation), early humans derived the concept of a month divided into four weeks of seven rising and setting suns. From the 365.25-day solar cycle, humans derived the concept of a year. And because 365 is not evenly divisible by 28, early humans were challenged to develop sophisticated astronomy and mathematics in order to construct consistent calendars. Telling time has been a long and important preoccupation. 250 years ago, however, something conceptually profound changed when we began to graphically represent history in fixed timelines. The first fixed-scale historical timeline was deployed in 1769 by Joseph Priestley, the famous scientist and dissenting clergyman, when he published A New Chart of History. Priestley used a consistent timescale moving left to right in unvarying vertical increments to plot out major events and personages of world history as then known to him. A new genre of historical representation was born, which quickly came to dominate human consciousness. Time was now measured and fixed—a linear stream of events running from past to present into an unfolding future. Patterns seemed to emerge. History seemed to push forward through some kind of ordered process. Today we need logarithmic scales to plot a universal timeline of history. Modern humans go back about 200,000 years and our lineage of hominid ancestors 7 million years further. The Earth’s story extends 4.5 billion years. The universe stretches back some 13.7 billion years. 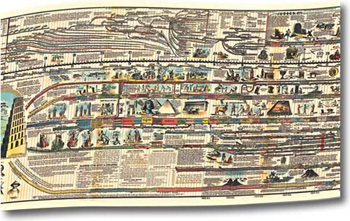 All of Priestley’s New Chart of History up to the present—covering only 5,000 years—would be but a thin line at the end of a mile-long scroll of the new history of the universe. Logarithmic scales allow us to present data from a wide range of values on a single chart. For instance, the increments might jump from 1 year to 10 years, to 100 years, to 1000 years, and so on, all the way past 10 billion years ago. By using a logarithmic scale, in this case the power of 10, we can reduce the mile-long fold out chart to a more manageable size. It the example here we have traveled 10 billion years (1010) in a scale of only 10 steps. A Correlated History of the Universe is the new chart for the new cosmology, and of course, it is organized around a logarithmic timescale. 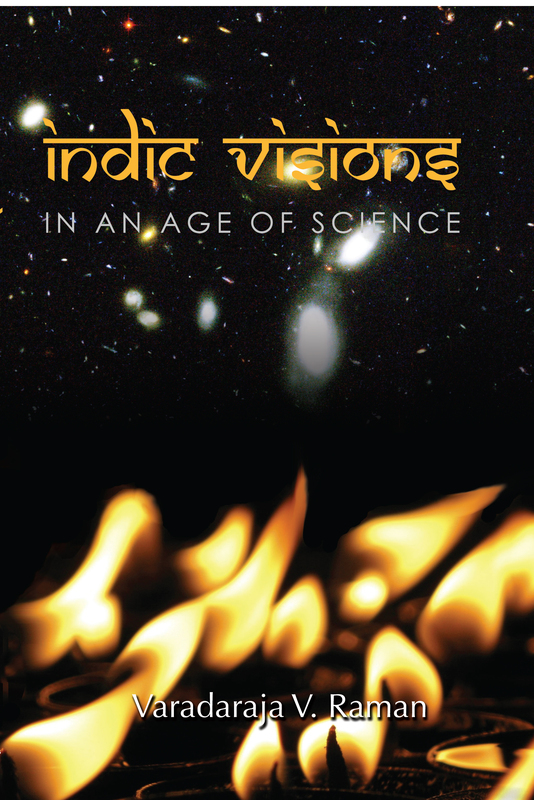 It is the most comprehensive compendium of scientific facts on a single page that I know. It looks like a folded road map and opens to 38 inches high by 28 inches wide. No reason to leave home without one of these maps of time stuffed in your glove compartment or backpack. 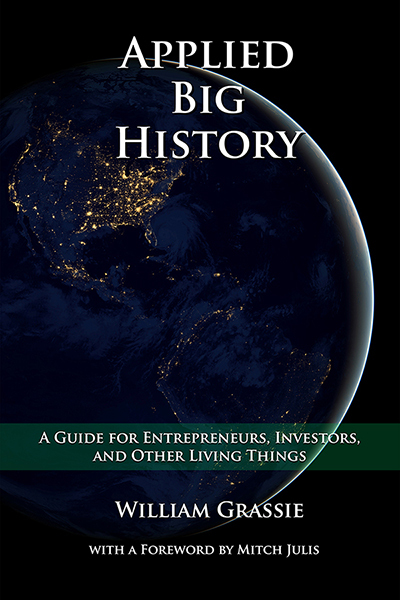 A Correlated History of the Universe was created by Paul R. Janke, a software engineer turned autodidact scientist, designer, educator, and founder of Pan Terra, which can be found online as “World Museum of Natural History.” The project’s antiquated website is hardly worthy of its ambitious title, but it is from here that you can buy this outrageously well-designed poster. 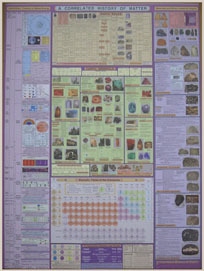 A Correlated History is really two posters combined front and back which were previously only available for purchase in laminated classroom editions. The stiff laminated posters that were not conducive to space and time travelling. On one side of the fold-up time map is A Correlated History of Matter and on the other side is A Correlated History of Earth. A Correlated History of Matter documents the evolution of matter in the universe. Organized in three columns, the left column represents the 14 billion year history of the universe in logarithmic scale. The first nanoseconds, seconds, minutes, hours, and millions of years take up three quarters of the vertical scale. Temperature-energy levels of the early universe are also plotted, as are their corresponding intensities in the particle accelerators at CERN, Fermilab, Brookhaven, and Lawrence. From the superhot, superdense plasma of the early universe through the dark ages to the formation of stars and galaxies, it is all there reduced to 38-inch high timeline. The middle column is not scaled. It begins on the bottom with the fundamental forces—strong, weak, gravitation, and electromagnetic—and the fundamental subatomic particles—quarks, leptons, fermions, and the assorted classes of charms, muons, tau, strange, ups and downs. The periodic table of elements, an emergent threshold of complexity resulting from stellar fusion and supernovae, appears above the fundamental particles. Above that are tables of earth rocks and minerals with interesting photos of crystals and rocks. So the middle column does present an ordered relationship to the emerging complexity of matter, and using the logarithmic timeline on the left, you can see when these new forms of complex matter— from the subatomic to the elements to the complex chemistry of our second- or third-generation solar system—arose in the universe. An hour studying this chart will familiarize one with the major features of the Standard Model in contemporary physics and cosmology. Two-thirds of the poster is devoted to geology—igneous, metamorphic, sedimentary, and magma—and perhaps not enough is devoted to complex chemistry. Missing also is a logarithmic scale of size from the Plank scale to the background radiation from the Big Bang. And while few would understand its significance, a diagram of the Light Cone of Relativity Theory is also needed as a nod to space-time. Instead, there are a lot of photos of Earth minerals including chemical diagrams of their crystal structures. Curiously, the entire right hand column is devoted to cataloguing meteorites and rocks created during impact events. The impact events turn out to play a prominent role on the other side of the poster. The other side of this map of time is A Correlated History of Earth. It uses a 4 billion year vertical logarithmic time scale. The left column also contains geological maps of the Earth throughout its restless history — plate tectonics, average temperatures, atmospheric levels of carbon dioxide and oxygen levels, and little icons to indicate the formation of mountain ranges and major volcanic eruptions. If you want to know what the Earth looked like during the Triassic Period start with the map of Pangea 250 million years ago and read horizontally across to see what is the state of plant, invertebrates, fish and amphibians, reptiles, birds, and the then just-beginning lineage of mammalia. It is the correlation of geology and evolution that makes this poster so illuminating. Of special interest is a column listing major impact events. The diameters of the resulting craters are numbered and graphically scaled. For instance, the Chicxulub impact in Mexico, credited with wiping out the dinosaurs, is recorded on the chart at 65 million years ago and as 180 kilometers in diameter. It was not the largest nor an isolated event in the deep time of geology. The many hundreds of impact events recorded in this column give new meaning to the concept of creative destruction. Janke is an advocate of a new astronomical model that correlates impact and extinction events on Earth with the 186 million year orbital period for our solar system around the center of the Milky Way galaxy. We really need a third poster to complete our universal timelines, one that synchronoptically represents the history of humans along with the Earth and cosmos. 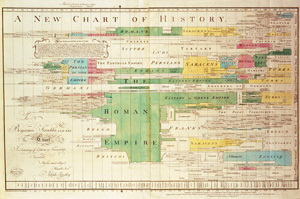 Joseph Priestley’s New Chart of History was a very limited and selective representation of the rise and fall of civilizations, but it inspired a new and popular genre. I recall a long timeline stretching above the blackboard in the history teacher’s classroom in high school. The details were largely lost on students because it could only be read at eye level, up-close, with a magnifying glass. But from afar, one could still see the streams of civilizations. Victorian-era illustrations appeared throughout. Six thousand years of kings and queens, wars won and lost, prophets and philosophers, artists and romantics, epic dramas and achievements. You can still buy this poster today online. The first edition dates back to 1871, the work of Sebastian C. Adams, a pioneer minister and teacher from Salem, Oregon. The original title was Synchronological Chart. 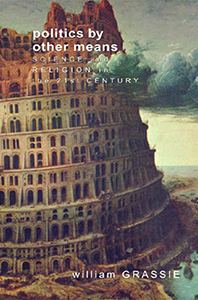 It begins about 4000 B.C.E with Adam and Eve, following the biblical narrative, and then continues with a secular history of the rise and fall of many civilizations around the world. Cincinnati lithographers then added their artistic refinements to Rev. Adams concept. The original chart was 17 feet long and more than 2 feet high. It was hugely popular and soon knockoffs were printed all over America and England. 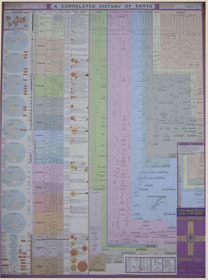 The original Synchonological Chart is often misattributed to Edward Hull, an Irish scientist who added a chart of geological strata in an 1890 edition. Over the decades, numerous editions followed with the timeline extended and information updated. 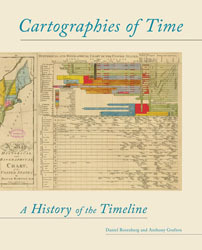 It is branded today as Timechart History, which includes the 20th century while maintaining the earlier style of illustrations. Time is measured out in a fixed scale running vertically—100-year increments over 6000 years. It stretches out 15 feet. If we were to start anew in designing a time-chart of human history to add to our collection of maps, we would want to adopt a 7 million-year logarithmic time scale so as to represent the hominid lineages. We would want to include maps showing the migration of our species around the planet—the only large mammal to do so. Neolithic art and tools would be pictured. The 10,000 years since the advent of agriculture would present a special challenge. How does one graphically represent the rise and fall of civilizations? Perhaps we would include a cladogram of human languages. And we also would need to somehow graphically capture the significance of human population growth, energy consumption, agricultural production, economic exchange, technological innovation, and much more. What is the best way to visually represent the human drama in this new, vast unified understanding of the universe and ourselves? How do we combine so many charts and graphs into a single poster? We can lose the quaint Victorian illustrations, Biblical illusions, and Eurocentric biases, but what other prejudices and limitations would we intentionally or unwittingly introduce? These charts and timelines are powerful pedagogical tools. 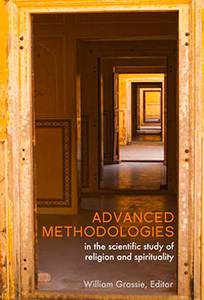 They provide a concise overview of the emerging scientific metanarrative. 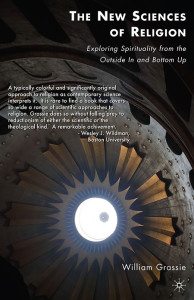 Science turns out to be a unified body of knowledge that can be hierarchically organized by chronology, scale, and emergent complexity and is best taught as such. I imagine the creation of a “Google Universe,” an app that would allow us to zoom in and out and virtually fly over Big History the way Google Earth allows us to see the cities, mountains, and oceans of our planet. But for now, I will carry a copy of A Correlated History of the Universe in my backpack and dream of a similar map of human history to complement it. 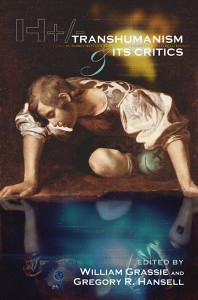 And I might not have to wait long: Paul Janke, as it turns out, has been working on A Correlated History of Humans for the last four years and promises to publish it in 2012. Please send me your favorite timelines and history charts in the comments below.